I love this photo. I sometimes like when the kiddos aren't looking into the camera. It's fun just to see them as they are! Adorable. This captures summer and childhood so well. I also get aggregated by Halloween items out in August. It was never that way as a kid. Didn't see them until October 1st as far as I remember. I think we got our first costume catalogue in July! Enjoy what's left of summer! Such a sweet shot!! You're the queen of candids! I am a little bit ready for fall - but Halloween things already! Yikes! What a sweet shot this is, Melissa! Things are changing pretty quickly here, weather-wise, and I'm hoping it's only temporary. There must be just a little summer left. I hope! Indeed a super busy time. I keep thinking it's going to slow a bit but each week it just ramps up the chaos. I'm with you on all the Halloween stuff--put it away, it's too soon! Try to enjoy these last days even though they sound really busy. 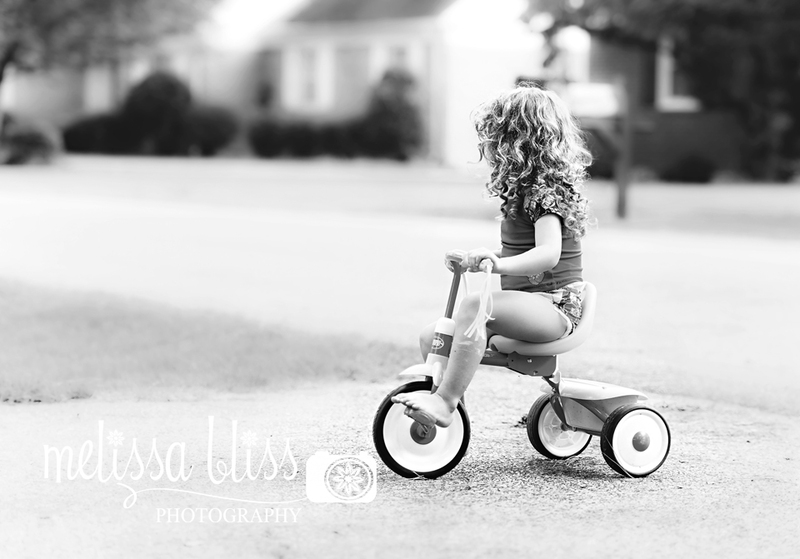 Such a cute bike rider you have--lover her curls!